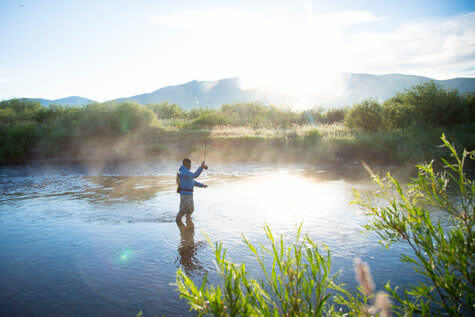 One of the locals’ favorite pastimes in Steamboat is fly fishing the the Yampa River. Anglers enjoy several miles of public access in town casting for rainbow and brown trout. The river offers a peaceful setting with stunning views and world-class trout. And the fun doesn&apos;t stop when the snow starts falling, around here we cast our lines year-round. Explore our state park fishing grounds in summer or winter by heading out to Stagecoach, Pearl Lake or Steamboat Lake State Park. Still not ready to drop in a line? The New York Times can tell you a thing or two about fishing in Steamboat Springs with their article, "Casting in Colorado Away From the Crowds". Local outfitters offer guided trips daily to other fishing spots. Get hooked up with one of our local shops in town if you need to rent equipment or would like to take a fishing excursion with a knowledgeable local guide. View our outfitters and local fishing shops below.